This Sign Supply Says Sale in a Loud Way! Wholesale Sign Supplies Online! Sign Making Equipment Company Sells Online at a Discount! 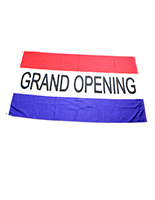 The sign supply is produced from nylon to make a more appealing and longer-lasting outside exhibit, when in comparison to polyester flags. 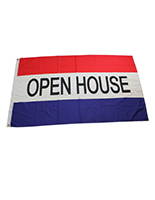 This red, white and blue banner is fitted with two (2) brass grommets for effortlessly fastening to a flagpole or rack. This sign supply also comes with a 2" canvas header for supplemented protection and durability. Be secure in knowing your sign supply will survive throughout many years of use! The sign supply, also known as a sale flag or communication flag, has a simple yet effective design that attracts targeted patrons into your commercial shop, eatery, café or salon! 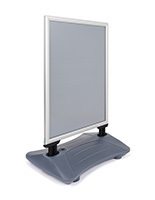 This sign supply can make onlookers gravitate towards your sales! The content flag, sign supply has a universal red, white and blue design that is familiar to patrons. 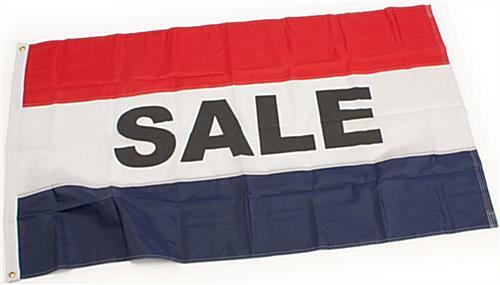 Thus, this sign supply, also recognized as an awareness banner, features the word "sale" composed in black, bold letters. The black lettering attractively contrasts the flag's white background, making your flag simple to read, even from a distance. We offer the sign supply with a big, 5'2"w x 3'h dimension so that onlookers can view your outside advertising sign with ease. Buy ready to ship sign supplies online today!